​​​​ WILMER – Amazon is working on a deal to lease more than 1 million sf of warehouse space along I-45 for another new distribution center. The online sales firm is eyeing two buildings in Southport Logistics Park, a $500 million industrial project directly across I-45 from Union Pacific Railway's Dallas Intermodal Terminal. The company is already advertising for workers in Wilmer. 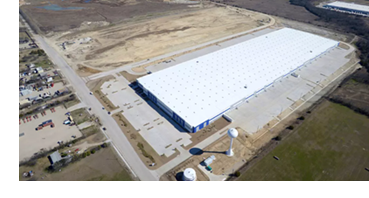 Developer Port Logistics Realty finished the first 1.1 million-sf warehouse in the Wilmer industrial park early last year and built an adjoining, almost 400,000-sf building. Word of the deal is widespread among industrial real estate brokers.